What can I learn from the label of an olive oil container? "Extra Virgin" is the highest quality. It is always cold-pressed which means that the olives did not lie around indefinitely before pressing, which may be the case for supermarket grade oils which may include oil from olives that have dropped onto the ground. The acidity level is never higher than 1% (1 gram fatty acid per 100 grams of oil) which refers to the proportion of oleic acid, a monounsaturated fatty acid in the oil: the lower the acidity, the finer the oil -- up to a point. The difference between .02% and .03% is indistinguishable. High acidity is produced when the oil is made of the olives that have dropped from the tree and have burst open on the ground; or if the fruit is stored too long before pressing. "Pure" olive oil is refined so that all impurities have been removed - along with its flavor (like distilled water). They then add some extra virgin oil to give it some taste. This cheaper oil is only suitable for frying. Of course, all olive oil is filtered to some extent to remove unwanted residue such as leaf fragments. 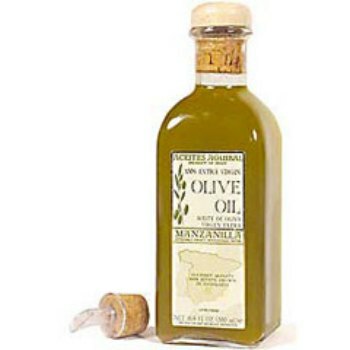 If the label says, "unfiltered", it means that filtering is held to a minimum, so that minute particles of olive will remain thereby enhancing the flavor of the oil. After a time they may settle to the bottom of the bottle. Finally, the labels of some unique olive oils proudly bear the term "D.O." or "Denominación de Origin" followed by the name of a town or region, such as Nuñez de Prado, D.O. Baena; Señorío de Vizcántar, D.O. Priego de Córdoba or Mas Tarrés Extra Virgin Olive Oil PDO Siurana. This is a government controlled official designation to assure you that the product is authentic. The raw materials are produced within a specific geographical area; the distinctive qualities and characteristics are due mainly to the natural environment; and the manufacture of the product follows strict guidelines. France has a similar system which assures you that a bottle of wine designated "Chateau Yquem" is really from Yquem; or that Roquefort cheese comes from that area and the cheese is formed in the traditional way; or that Champagne is really made in the region of France that originated this kind of wine. How healthy is olive oil? What factors make the best olive oil? We have listed below all of the olive oils that we carry, along with descriptions of their flavors and uses. Green salads and dipping with crusty bread; good for cooking meats, stews, seafood and sautés. Perfect for fresh salads and for sauteing vegetables and seafood.